The Health Resources and Services Administration (HRSA) reports that the United States has roughly 74.5 primary care physicians for every 100,000 residents. For HRSA purposes, primary care physicians include non-federal osteopaths and physicians who are not hospital residents and who have a declared practice specialty in General Practice, General Family Medicine, General Internal Medicine or General Pediatrics. 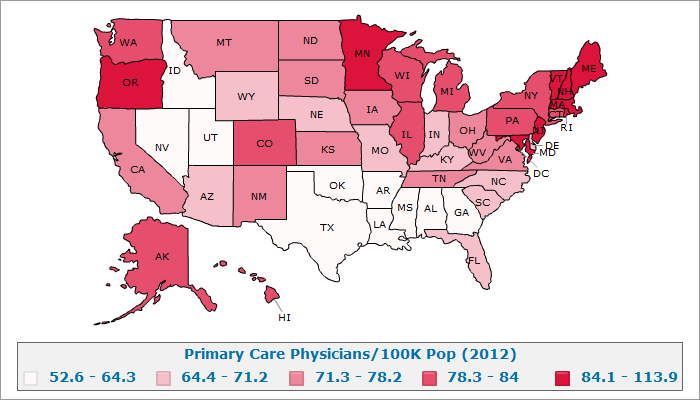 A more detailed examination of the underlying data reveals that outside the Northeast, the only states with top ten primary care coverage were Oregon and Minnesota. Note: National rank includes the District of Columbia, which is #1 nationally with 113.9 PCPs per 100,000 residents.